The 1966 10 shilling coin was a one year coin issued to commemorate the 50th anniversary of the 1916 Easter Rising. On the Monday after Easter in 1916, Irish rebellion groups seized multiple government buildings to end British rule. After a week of bloody fighting the British Army crushed the insurrection, captured the rebellion leaders including Patrick Pearse leader of the Irish Volunteers and executed them. Pearse’s death as well as the arrest of hundreds of Irishmen ignited the fire of revolution and started the War of Independence which lasted until 1921. A peace treaty was agreed to in 1922 that would partition Ireland into North and South with the North keeping ties to Britain while southern Ireland was ceded to the rebels and declared a free state. 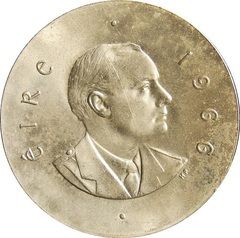 The obverse design features the bust portrait of Patrick Pearse. The outer periphery has the legend “EIRE” or Ireland and the year of issue 1966. 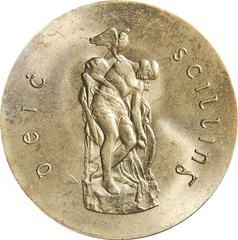 The reverse features an image of the mythical Irish hero Cú Chulainn statue sculpted by Oliver Sheppard. The outer periphery has the legend DEIC SCILLING. The coin edge is inscribed with the phrase "Éirí Amach na Cásca 1916", which translates as "1916 Easter Rising". Coins were saved by many collectors and non-collectors alike and are readily available in conditions of AU or better making this an affordable silver coin.